When AMT Corp. acquiring the rights to manufacture the real Piranha vehicle, they naturally decided to produce plastic model kits of the cars. 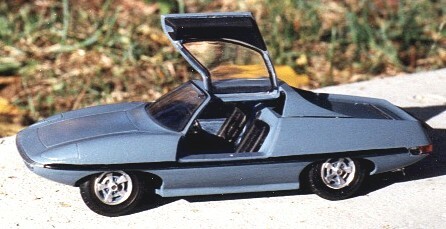 In the years that followed, AMT released model kits of the Piranha Dragster, the "Man from U.N.C.L.E." car, and various other versions of the cars. Above is a photo of a built AMT "Man from U.N.C.L.E." car in 1/25th scale. Use the link below to see a detailed history of AMT's plastic Piranha kits.